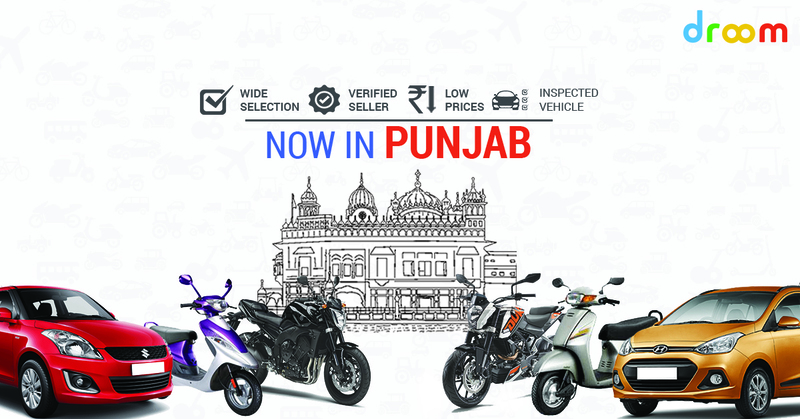 Droom, India’s first online marketplace for buying and selling automobiles is now available in Chandigarh, Ludhiana, Ambala, Patiala, Bhatinda, Amritsar, Jalandhar, and more cities of Punjab. After fulfilling so many dreams in Delhi NCR, and then in Mumbai, now we are very excited to make some happy stories in Punjab too. Droom is the most trusted fully transactional online platform to buy and sell used motorcycles, cars, scooters, bicycles, superbikes, and almost everything on the wheels. Cool hunks and sweet kuddis can show off their ‘punjabi tashan’ cruising down the roads in super chic and ultra-luxurious supercars from droom.in. Simply, get ready to rev up the roads with powerful monstrous superbikes made to show off the masculine side of all bikers. We have got largest collection of used bikes, cars, supercars, premium cars, superbikes, scooters, bicycles, and even planes that you won’t find elsewhere. Every deal is inspected and comes from a verified seller. Buyers can simply pay 2% fully refundable token amount to book the vehicle on his name and later he can test drive, inspect and check documents of the vehicle. Droom offers multiple benefits to seller community also by offering an online showroom to sell their vehicle to over one million online buyers. Sellers can now sell nationally and build brand value by exploring benefits of the Droom’s online platform. They can see business analytics, upload listing anywhere anytime, and keep their business running 24×7. WOW! So, stay in touch and keep drooming with us! Droom Launches Total Cost of Ownership Tool for Buyers!